The UK Onshore Geophysical Library's William Smith - Interactive has wound me up. It represents a cartofail that's extremely common. 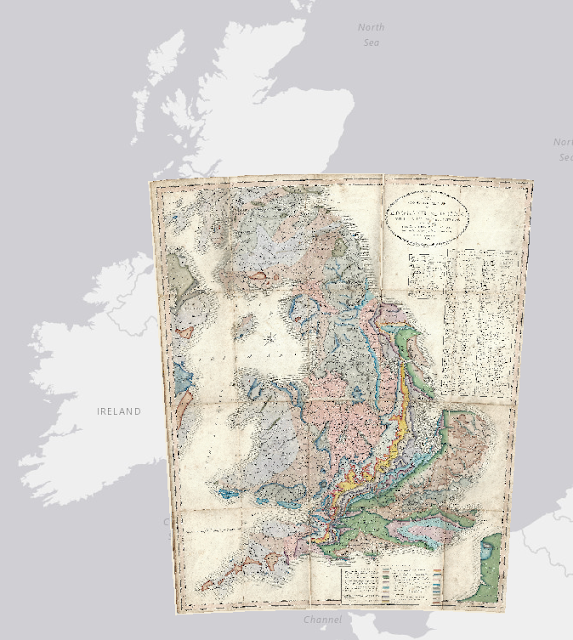 William Smith produced his classic and beautiful maps of the Geology of England and Wales in the early 1800s. They are stunning. making them available digitally is also wonderful but...and this drives me nuts - why oh why, time and time again do we see people scan these wonderful old maps and then warp them to Web Mercator? There's a reason Smith chose the right projection for his maps....because it was the right projection. Would it not be easier to just change the projection of the web map service you're using and then allow the maps to be seen as intended? Instead we get the maps stretched and distorted. Horizontal text also becomes stretched and sits on a curve. It looks absurd. 200 years ago Smith made his map right. The very least we can do is honour it by using modern technology to re-present his work properly, not turn the warp factor up to eleven. Correct me if I'm wrong but isn't it still pretty hard to make a zoomable tiled web map with anything other than Mercator? Disclaimer - I work for Esri and this blog is not affiliated with Esri at all but...it's been possible to make tiled maps in non Web Mercator for several years using Esri's ArcGIS, published through ArcGIS Online. It's also now possible to make vector tiles in non Web-Mercator using ArcGIS Pro and publish online. Some other map providers have tools that also support non Web Mercator. It's not particularly difficult at all. @Ken, What projections is then shown by ArcGIS?